Folding Beijing Is a Sturgeon Award Finalist! Wonderful news, Space Unicorns! “Folding Beijing” by Hao Jingfang (translated by Ken Liu) is a FINALIST for the prestigious Sturgeon Award! We are all so thrilled. Congratulations to all of the finalists! The Gunn Center for the Study of Science Fiction is pleased to announce the finalists for the Theodore Sturgeon A. Memorial Awardfor the best short science fiction story of 2015. The award is given during the Campbell Conference which, this year, will be part ofMidAmeriCon II, the 74th World Science Fiction Convention, in Kansas City, Mo. The awards ceremony is scheduled for the evening of Thursday, Aug. 18. “And You Shall Know Her By The Trail Of Dead,” Brooke Bolander.Lightspeed, Feb 2015. “The New Mother,” Eugene Fischer. Asimov’s, Apr/May 2015. “Folding Beijing,” Hao Jingfang, tr. Ken Liu. Uncanny Magazine, Jan/Feb 2015. “Emergence,” Gwyneth Jones. Meeting Infinity, ed. Jonathan Strahan.Solaris. “Damage,” David D. Levine. Tor.com, 21 Jan 2015. 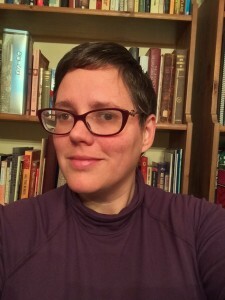 “The Game of Smash and Recovery,” Kelly Link. Strange Horizons, 17 Oct 2015. “Our Lady of the Open Road,” Sarah Pinsker. Asimov’s, Jun 2015. “The Three Resurrections of Jessica Churchill,” Kelly Robson.Clarkesworld, Feb 2015. The Sturgeon Award recognizes the best science fiction short story each year. It was established in 1987 by James Gunn and the heirs of Theodore Sturgeon, as an appropriate memorial to one of the great short-story writers in a field distinguished by its short fiction. As you may remember, one of the stretch goals for the Uncanny Magazine Year Two Kickstarter was a new webcomic feature. 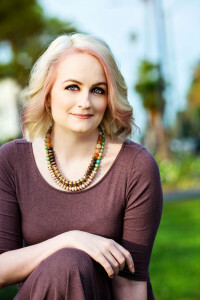 Each issue, the multi-talented Liz Argall will have a special Uncanny edition of her webcomic Things Without Arms and Without Legs where they react to a piece in the current issue of Uncanny Magazine. This month, they’re reacting to Jim C. Hines’s “Men of Their Times” from Uncanny Magazine Issue 9. When I begin a dialogue about BPD, the responses can at times be disheartening. Even once the first barrier of unawareness is passed, I immediately run into palpable waves of dismay and loathing. It would be difficult to find a mental illness that has a worse reputation than BPD among those who understand it. The hallmarks of the related dysphoria have spawned the reductive “Crazy Ex” stereotype: intensity, neediness, impulsivity, addiction, self-harm (particularly when faced with abandonment), fits of terrifying rage, and inability to hold long-term jobs, relationships, or even identities. Why, then, would a writer choose to saddle her protagonist — the character for whom audience identification is most important — with a disorder that provokes such an antipathetic response in nearly everyone who understands it? The obvious answer would be, “To raise awareness,” but what good is awareness if it brings only revulsion? So there must be something else at work if the experiment is to succeed, and in the process of creating Millie I discovered something interesting. A Borderline (if you’ll forgive the reductive label for the sake of brevity) is uniquely qualified to excel in a fantasy narrative — especially a story wherein the existence of magic is a well-kept secret. Millie spent the first twenty-six years of her life unaware of the existence of magic, and now has to accept (and operate within the rules of) of a magical parallel universe, all within the space of a week. A tall order, but perhaps the most powerful advantage a Borderline has in adjusting to an influx of fantastic knowledge is that for her, paradigm shifts — those moments when we realize that the rabbit we’ve been looking at is actually a duck — come more easily. Borderlines tend to question everything. Their world is never stable; everything is continually reinvented and recategorized, and drastic paradigm shifts are regularly accomplished with minimal supporting evidence. Sometimes this learned malleability is dangerous — it could make Borderlines vulnerable to cult leaders, pyramid schemes, and conspiracy theories — but at other times it can be extraordinarily useful. Borderlines are so accustomed to finding out everything they know is wrong that it may not take much effort to convince them of a shocking truth. Another fantasy-relevant bug in Borderline cognition is the defense mechanism known as “splitting” – the tendency to sort people or ideas into extremes of black and white. In the real world this is catastrophic in relationships and discourse, but from Tolkien to Rowling, fantasy realms have long been welcoming habitats for ethical extremes. The intensity with which a typical Borderline yearns to cooperate with “good guys” and destroy “bad guys” serves her well in a universe where such categories cleanly manifest. The very same polarity of idealization and devaluation that makes a Borderline difficult to relate to in real life renders her heroic once she is placed into a context where swift identification and categorization of morality is important to survival. Those who vacillate when faced with True Evil rarely live to tell the tale. By nature, a realm with an extreme ethical binary can only be a fantastic one, but if the story you’re writing happens to be a fantasy, a Borderline can serve well as a protagonist even if her course of treatment has not yet managed to bring her “splitting” under control. Perhaps the most infamous Borderline trait — and a common feature of “Crazy Ex” stories — is intensity of emotion. This intensity is seen as so excessive by neurotypical adults that it is usually dismissed as a performance, leading to the historical confusion of Borderline Personality Disorder with sociopathy (the name itself comes from the now-rejected theory that those with the disorder are not fully sociopaths, but just at the border). For the Borderline herself, the disorienting gulf between her emotions and others’ responses contributes in part to a staggering suicide rate: Borderline Personality Disorder is fatal to one in ten people diagnosed with it. Fantasy, however, is merciful to volatile people. Intensity is organic to magical worlds: curses cripple, enchantments enthrall, worlds hang in the balance. In many plotlines involving magic and monsters, cool detachment is not only unnecessary but perhaps even contraindicated. So in fantasy, at least, a Borderline is in her element. And if we can imagine a context in which a stigmatized disorder does not destroy the life of the person who suffers from it, what questions does that raise? In the absence of magic, could we find a context in which a person with Borderline Personality Disorder could thrive: where mental flexibility can be crucial, and where the caustic fuel of emotional intensity can be burned to good purpose? My own experience suggests that this is not so far-fetched. While there is no cure for Borderline Personality Disorder, those with the diagnosis are not doomed to miserable lives. With carefully practiced coping skills to blunt the most painful edges of the disorder’s symptoms, and with a context that makes use of an intense and agile mind, some of the more intractable quirks of Borderline cognition and motivation can be every bit as useful as they are frustrating. A fantasy novel isn’t the only place where a Borderline can have a happy ending. For now, though, it’s possible that the idea of a fulfilling and dignified future for the Crazy Ex is too drastic a paradigm shift for many. Luckily, we have fantasy: a dress rehearsal for hope, a place where even the most comfortably settled minds can give themselves permission to train for the impossible. 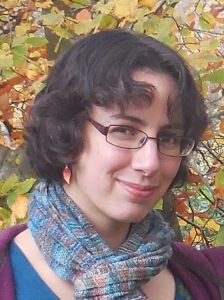 Pockets by Amal El-Mohtar Is the Favorite Uncanny Magazine Story of 2015! Space Unicorns! We have tabulated the results of the Uncanny Magazine 2015 Favorite Short Story Poll, and “Pockets” by Amal El-Mohtar came in FIRST PLACE! Amal will be receiving a FANCY CERTIFICATE suitable for framing. And now, the rest of the results! Thank you, Space Unicorns, for participating! Happy New Year, Space Unicorns! We’re excited to see what 2016 brings, because 2015 was a fantastic year. We’re thankful for all the support and enthusiasm Uncanny Magazine has received, and while we have our personal favorites, we’d like to know which stories YOU loved from Uncanny in 2015. We’ve set up a poll for Uncanny readers to vote for their top three favorite original short stories from 2015. (You can find links to all of the stories here.) The poll will be open from January 11 to January 25, after which we’ll announce the results. We will also be running polls to ask what your favorite poems, nonfiction, and cover art were in the coming weeks. We can’t wait to hear from you about the Uncanny stories, poems, nonfiction, and art that made you feel! The creators who come out on top in the polls will receive a snazzy certificate! It’s the time of year when people post their year-in-reviews to remind voters for the different SF/F awards what’s out there they might have missed and which category it’s eligible in (especially for the Hugo Awards and Nebula Awards). This was the first full year of Uncanny Magazine (Issues 2 through 7). We are extremely proud of the year we had. 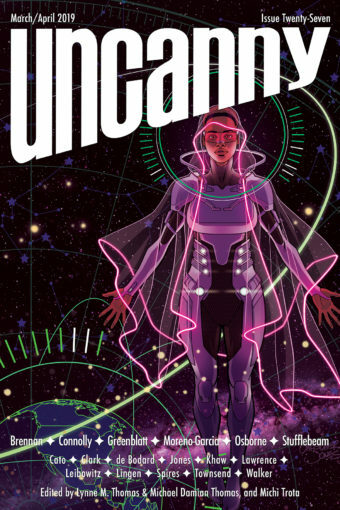 This year, Uncanny Magazine is eligible for the Best Semiprozine Hugo Award for the first time. Lynne M. Thomas and Michael Damian Thomas are also eligible for Best Editor (Short Form) Hugo Awards. 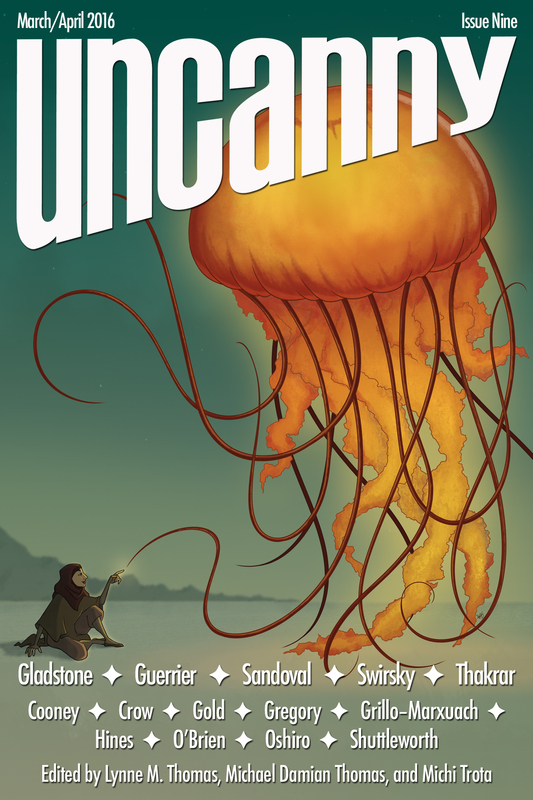 If you are an SFPA member voting for the Rhysling Awards, you can find all of the Uncanny Magazine Issue 2-7 poetry here. 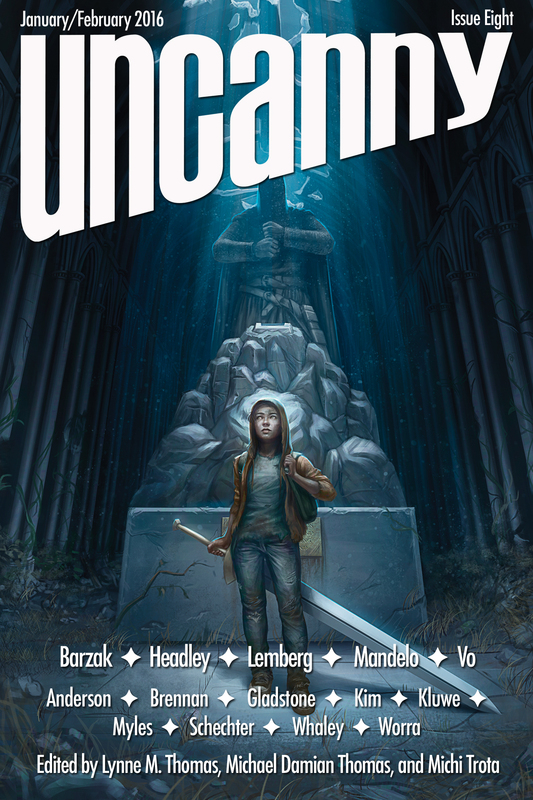 Uncanny Magazine Issue 8 Cover and Table of Contents! Coming January 5, THE EIGHTH ISSUE OF UNCANNY MAGAZINE!!! The free online content will be released in 2 stages- half on day of release and half on February 2.